In the [traditional] selling scheme the seller is located at a distance from buyers and reaches out with a sales department to unload products on them. This is the basis for the notion that a salesperson needs charisma because it is charisma rather than the product’s qualities that make the sale. Consider, by contrast, marketing. Here the seller, being physically close to buyers, penetrates their domain to learn about their needs, desires, and fears and then designs and supplies the product with those considerations in mind. Instead of trying to get buyers to want what the seller has, the seller tries to have what they want. The “product” is no longer merely an item but a whole bundle of values that satisfy buyers—an “augmented” product. This was written around 1960-1970’s. And it really worked that way. Salespeople were known to be the best in communication, they could sell any product because the buyer trusted more of the salesperson than the product by itself. This is how insurance agents sold those policies which never really mattered to us. But underlying things are changing. With the penetration of internet, easy access to information, the buyer is extremely informed now. Many things what salespeople want to say, he already has researched. The buyer today has more knowledge of product or service because as a buyer he is concerned that he doesn’t want to be sold wrongly. Now if your company is not doing the marketing and the first touch point to the buyers of your product or service is from sales person only, then salesperson cannot just rely on charisma now, but he has do the marketing work. What is the marketing work means here? It is about understanding buyer needs, desires, fears and then offering solutions matching his unique needs. If your salesperson is not trained for this than he will just try to sell what he has with his charisma and can make few sales. The cost of this approach is, long-term relationships won’t be built as a salesperson just dumped what he had. Of course being charismatic doesn’t come naturally to many. So they struggle to sell and rely on discounts, offering low price! How to increase the sales? Some businesses can get away with salespeople who don’t need to deeply understand the buyers, whereas for other businesses that won’t be the case. If companies want to build the long-term relationship with customers, understanding everything about the buyer, his situation, his needs and overall the buying environment are very key. Below figure gives 4 different possibilities of business types of buying environment against the solution types. 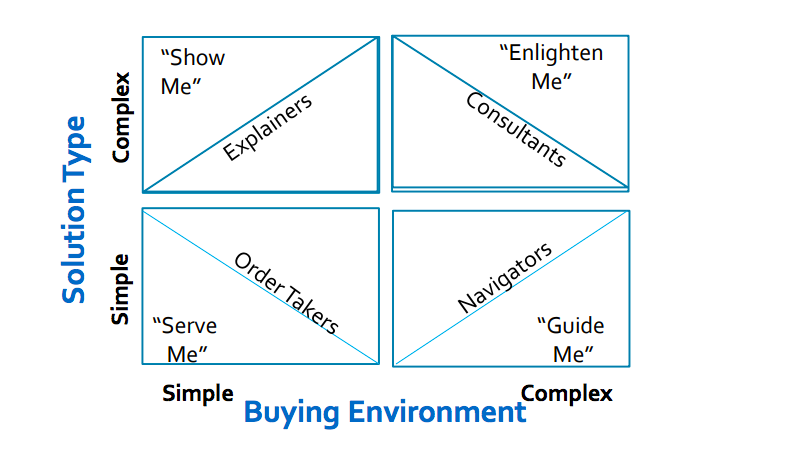 For each quadrant, the salesperson needs to play the role accordingly. Based on the buying environment and solution type, the salespeople skills sets, attitude to be developed. Different businesses require a different level of the expertise around this. Let us explore more on understanding sales people role for different buying environment and solution types. Salespeople as order takers: This works fine only on industries where buying environment is simple and the solution you are offering is also simple. Or this also works where your product is marketed extensively and the buyer is pre-qualified, pre-motivated and pre-decided to buy. All that buyer asking is in this case is “Serve Me” because he is very clear what he wants. Ex: Sales executive in a consumer retail store. In this case, the buyer knows clearly what he wants, buying environment is easy as he can come and select the product and all sales executives have to do is a minimal help to clarify doubts and take the order. Ex: Financial products, auto retail, luxury homes selling. The buying environment is very simple as with a click they can buy but the buyer is confused with too many choices and complexity of solutions. Many companies have a tendency to add so many features to fit all kind of buyer needs. Salesperson role is critical here to explain what is relevant and how features benefit the buyer. Salesperson as Navigator: Here the buyer wants more of guidance from a salesperson. The product or solution looks simple but the buyer doesn’t see the real benefit. Or buying this can involve huge switching cost, disruption in existing service. Ex; Installation of solar. The sales person has to guide the buyer the advantages. NBFC’s asking people to switch their loans from other companies. The buyer doesn’t know what is good for him and salespeople have to navigate the buyer through the complete sales process. Salesperson as a consultant: This is a most complex stage where buying environment, as well as the solution type, is very complex. The switching cost can be extremely high and involves multiple stakeholders for approval. The salesperson must be in a position to enlighten the customer by making them aware of the problem and how their solution helps address and involves multiple stakeholders. The salesperson should create that “aha” moment in the buyers. Ex: Technology disruption businesses such as new platforms, SAAS products, Medical diagnostics equipment companies. The days of the salesperson as being charismatic and making a sales without understanding what buyer wants is over. To build long-term relationships, salespeople cannot be just dumping what they have to a buyer. Today buyer wants to be in control of buying and salespeople must respect that. The salesperson role is to understand the buyer needs, wants, fears and aspirations and help him buy. Gathering these psychological data from the buyer is more of listening skill sometimes than asking clever questions during the initial interaction with the buyer. Next Post What is not sales coaching?